There are so many New Year’s Resolutions made each year, and it’s a commitment to keep them! 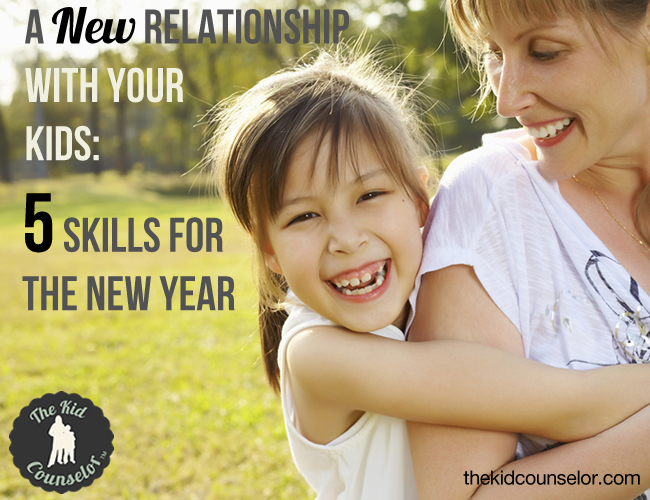 One of the resolutions that I think is the most important that you can make for this new year is a more loving, respectful, and communicative relationship with your children in 2016. Here are my top five tips for creating the type of family that you desire with play therapy principles! Limit setting is an effective way to move a child away from a behavior that is not acceptable in a respectful and kind way. This allows you to be in control of the situation, while still giving the child a measure of control as well. You set the limit, and allow the child to decide which action to take. This would look like: “I know that you are having fun with the Legos, but it is time for dinner. You can choose to put the Legos away right now, or you can choose to eat now and play with the Legos after dinner. Which do you choose?” **Notice how this skill uses Reflecting Feelings and Choice Giving! As you commit this year to a healthier and happier family life, and a better relationship with your children, please know that it is possible and easier than you may think! A few skills added to your tool belt, based in play therapy, can give you more confidence in your parenting and your ability to connect with your children. Parents that have taken my online parent training (Child Parent Relationship Therapy) are still telling me what a difference a few short weeks made in their relationships and their families!